Are you free this Sunday 5th April 2009?? 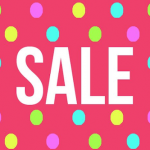 If you live around Perth and would like to help cute doggies, why not attend this annual garage sale at Swan Animal Haven? 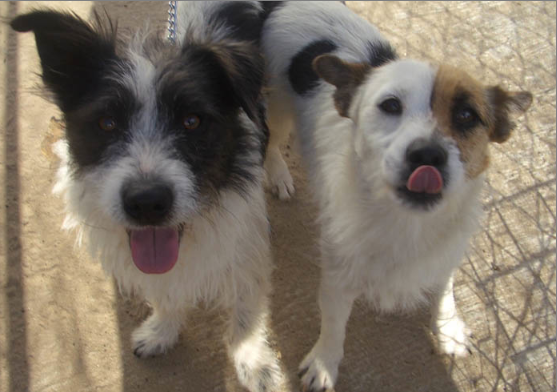 This dog home is located at 21 Kalamunda Road, South Guildford in Western Australia. Donations of cakes, jams, plants and bric-a-brac would be much appreciated. This afternoon D and I were wondering around Fremantle area. I wasn’t looking for anything to buy, but when we stepped into E-shed market I found these wooden plates at a small shop inside of market. It’s a set of 6: 2 wooden plates and 4 small forks, and they were $2.00. Yes, $2.00 for 6 pieces. Pretty cheap, huh?? All the products in the shop are from 100 yen shop in Japan, and they are selling them here at $2.00. Considering the current currency rate, I think it’s a good deal. I suddenly remembered how things were nice and cheap in Japan compared with Perth. If you want to buy this type of thing somewhere else here, I assume that it’ll probably cost around $10.00! I was already happy when I left the shop, but then one bonsai stall caught my attention. There were varieties of bonsai trees as well as some ornaments and bonsai instruction booklets. I decided to buy one bonsai kit: including one bonsai tree, plate, soil, bonsai food, wire (to re-shape the bonsai tree), one ornament and instruction booklet. It was $15.00. The lady was so nice, and she taught me how to maintain the tree and soil. 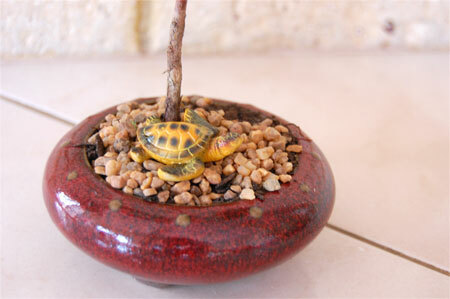 And, she said that we can bring in this tree every Sunday to show her and check how the bonsai condition is. of course free of charge. I was so lucky that I came here today! If you are interested in bonsai, check out her website Bonsai Palace. 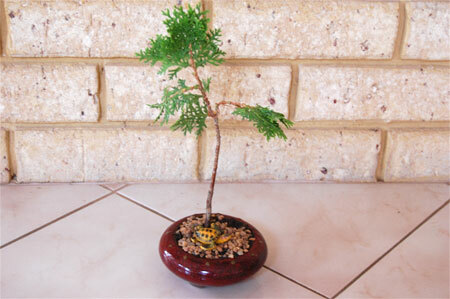 It’s got lots of tips and hints for growing beautiful bonsai trees. Well, I can’t complain, I know. She is cooking for us. So, I keep fresh vegetables in the fridge for myself to eat with her food everyday. Do you know what “sommelier” is? “sommelier” means trained and knowledgeable wine professional. So, it originally supposed to be pointing at “wine person”, however there are many unique professional people called “sommelier” in Japan. Cheese sommelier, Liquor sommelier should be common in other countries too ( I think), but there are knife sommelier, herb sommelier, rice sommelier, air sommelier, vegetable sommelier, etc… in Japan. Recently I was surprised when one of my friend sent an email saying “hey I got a certificate for Onsen sommelier”. Onsen means “hot spring spa” in Japan. I didn’t know there is such an occupation for being a professional about hot spring! She passed the exam to be Onsen sommelier, so she must know lots of nice Onsen in Japan. I will definitely ask her for recommendation! I really want to go to nice Onsen in Japan. Other day sister_in_law picked us up for quick lunch. She likes eating out and knows lots of nice places. This time she took us to this Bintang Cafe in Victoria Park. This cafe serves Indonesian food. I think their menu is real Indonesian food and comparable to ones you get in Indonesia as I ate similar food when I was in Jakarta. 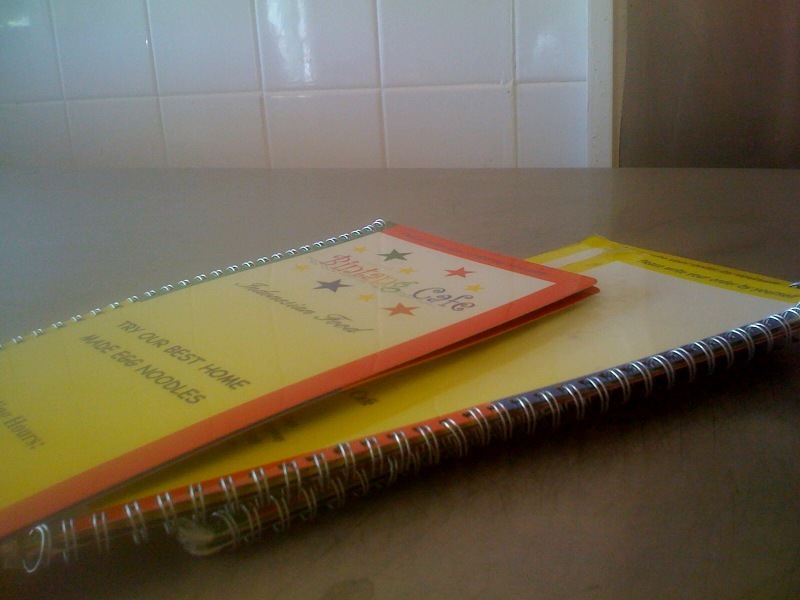 “Try our best home made egg noodles” According to their menu, it seems that egg noodle is their speciality! I normally prefer rice noodles, so I ordered kway teow noodle but I tried little bit of egg noodles from partner’s bowl. He ordered Mie Ayam Jamur & Bakso = egg noodle soup with chicken pieces and beef meat balls. I knew Bakso means “beef meat balls” and I ate this type of noodle back in Jakarta. It was nice. At first I thought the portion was quite small, but I was pretty full after emptying the bowl. The soup was tasty 🙂 I heard that some Indonesian places in Perth use MSG though… do they?? We also ordered chicken satay. It was really nice. I like the frame-grilled flavor… and the peanut sauce! Yum. I saw people eating some fish and chicken dish with rice. They looked really nice. The fish was grilled (or fried) and served with some sambal? I don’t know, I should try it next time. By the way this eating place is quite small, and the atmosphere reminds me of Indonesia. If you want to try typical Indonesian food (noodle, rice dish and some side dish) I recommend this place. This place is always full with Indonesian / Malaysian customers. Mix all the liquid together with egg. 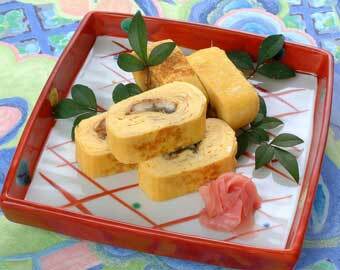 Heat up tamagoyaki ki (frying pan for tamagoyaki – Japanese rolled omelet) and pour 1 tsp of oil. Wipe off the excess with paper towel. Pour about 1/4 of the egg mixture into the pan and scramble as you would lightly cooked scrambled eggs. Over low heat, let the bottom of egg set. Once the bottom of omelet is set, place unagi on the egg; about 3 cm from the edge of the pan. Carefully roll up the egg, (same as making sushi roll) and push the omelet to the edge of pan. Clean the surface of pan with oiled paper towel. Pour another 1/4 of egg mixture into the pan and rotate the pan so that it coats the entire bottom. Quickly lift the cooked egg mass up and let the egg mixture flow underneath before putting it back down. This step is crucial in getting the layers to adhere. When the new layer of egg is almost cooked through but still a little wet on top, roll it up like step 5. Continue the process until you use up all the mixture. 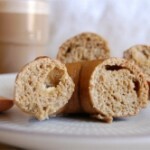 If the roll seems undercooked or unstable, you may want to turn the roll on its side and cook briefly to firm things up. *** You can use normal frying pan, but it’ll be little difficult to shape like how it should be. 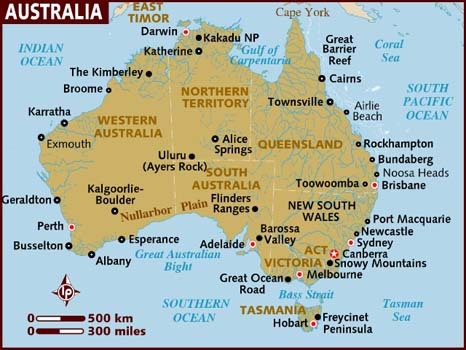 People get surprised when I tell them this, but I have never been outside of Western Australia. I’ve been living in Australia for almost 6 years, but never been to Melbourne, Sydney, Gold Coast etc… I originally love traveling, but I guess I haven’t had chance to go anywhere. It’s surprising to me too actually, I really think I should explore outside of WA sometime soon! More surprising thing is, I don’t even leave Perth Metropolitan area often. Plus I’ve never been to popular tourist destinations even around WA such as Monkey MIa, Wave Rock, Ayres (Airs) Rock, Albany etc. The places I’ve been since I came to Perth are Swan Valley, Rottnest Island, Margaret River, Pemberton, Busselton and Bunbury. Wow..
By the way I’m actually going back to Japan around September (as I promised my grandma on my previous homecoming), so the trip within Australia might going to happen next year. If I had a chance to fly to Japan I prefer it to anywhere else. 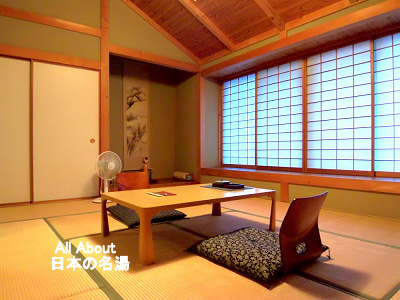 This time the Japan trip will be a different one as I’m planning traveling around Japan and stay at Ryokan (Japanese style hotel) with Onsen (natural hot spring) (our pre-honeymoon :)) I can’t wait! Traveling really eases my tension and stress. Both my fiance and I have been very busy over the last few weeks, so we agreed to take a break and have a relaxing dinner out. We both like any cuisine, but I felt like something “Japanese”. Not like “teriyaki set” or “tempura set”… real Japanese food! After thinking where we should go, we made a phone call to Satsuki Japanese restaurant to book a table. I’m glad that I choose this restaurant. The staff was so kind and polite. When I was making a reservation on the phone, the staff kindly told me “there is one table available for two, and counter seats. The available table is actually at between 2 large group bookings, so it may be little noisy.” After her suggestion, I booked counter seats. It was a great decision as those large groups were quite loud. 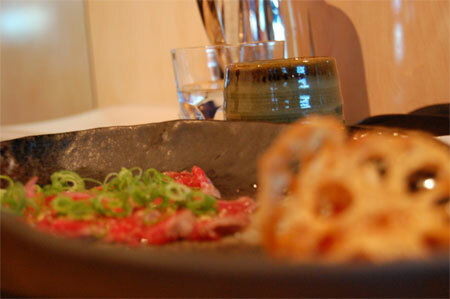 At the restaurant, we ordered Beef Tataki, Deep-fried Spicy Tuna Rolls, and Slowly Simmered Pork Belly. Deep-fried sushi rolls sounded interesting to me. Did they really deep-fry sushi rolls?? … yes, they did! 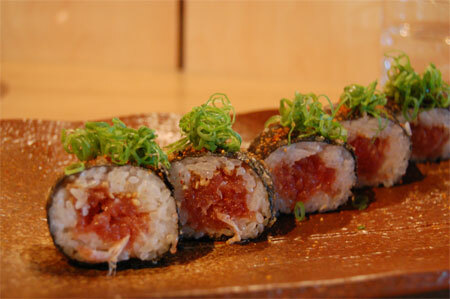 The tuna inside of the rolls was still raw as “sashimi”, and the tuna and spicy chili powder were well matched. I loved the way they arranged the food on plates. They use chic looking dishes, and the garnish is well presented. The crispy lotus root chips, garnish for Beef Tataki, were lovely. 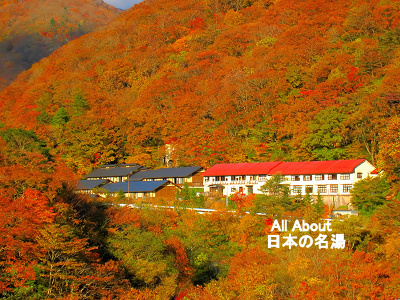 They close on Sun and Mon, and I recommend to make a booking on weekends. 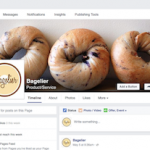 You can browse their food and drink menu from here. Why don’t you try this colourful Japanese dish? Chirashi-zushi is a kind of sushi: seasoned vegetables (carrots, shiitake mushrooms..) are mixed with sushi rice, and sometimes we decorate the top with sashimi (raw fish / fish roe / seafood), shredded thin omelet and kizami-nori (shredded nori seaweed sheet). Mix sushi seasoning into hot steamed rice. Allow to cool. 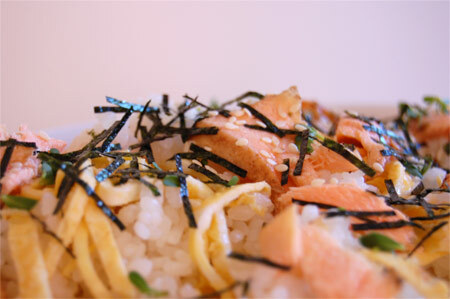 Sprinkle sake to salmon, and leave it for few minutes. Season salmon with salt and grill until just done. Whisk egg with few drops of water, and cook into very thin sheet. Remove from the pan and allow it to cool. Cut the egg sheet into thin strips. Break salmon meat. 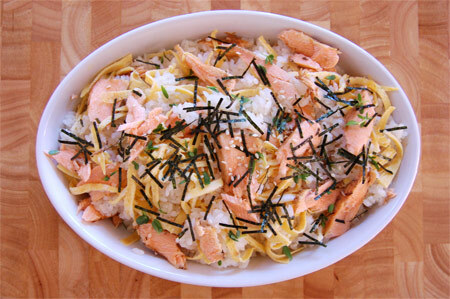 Arrange seasoned sushi rice with salmon, egg strips and kizami nori. It’s quite cheap to make if you don’t use sashimi or fresh fish roe (even though I love those expensive things :p) , or you can actually buy “chirashi zushi seasoning” which comes with kizami nori, and all the seasoned vegetables in the packet. I try to eat red meat often as I have very law blood pressure and need to eat iron rich food. I seldom ate beef when I was in Japan, but now I eat them a lot as they are pretty cheap in Australia (oz beef) and healthy. (Japanese beef got marbled fat, so they are high in calorie and fat) Some people say that red meat is very dry and tough, but I actually like it. 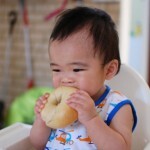 When you eat tough food, you need to chew and it strengthen your jaw. You can cook meat medium or medium-rare if you like it moist. If you go to Japanese restaurant here you might find a menu “teriyaki beef”. 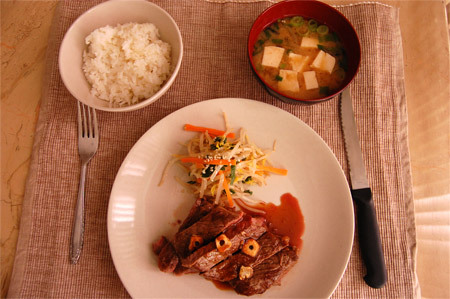 As I mentioned in an earlier post, there is no such food “teriyaki beef” in Japan. In Japan we’d call it “steak” or “yakiniku”, maybe. 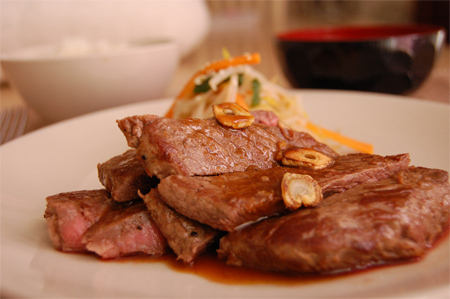 Japanese steak is often eaten with steamed rice. The sauce is soy sauce based, and most of the time it’s flavored with garlic. It’s very easy to cook. Well, it’s a steak: you basically just need to grill the meat. 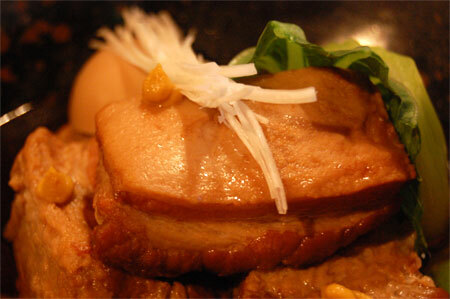 What you can do to make it Japanese style (wafu) is the sauce. It’s also easy to make too. Slice garlic. Place 1 tsp of oil in a pan and sliced garlic. Turn on the heat and cook them till crisp and lightly brown. Take the garlic chips out from the pan and set aside. Season the meat, and grill in the same pan. 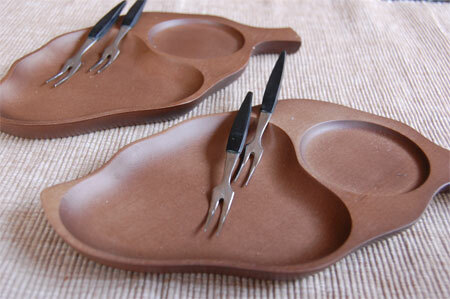 Arrange the cooked steak on a serving plate. Pour soy sauce and sake into the pan and bring to boil. Add garlic chips, and turn off the heat. Pour the sauce over steak. You can make the sauce separately. Cook garlic chips in a frying-pan, and take them out from the pan. Add soy sauce and sake to the pan and bring to boil. Add garlic chips to the sauce. 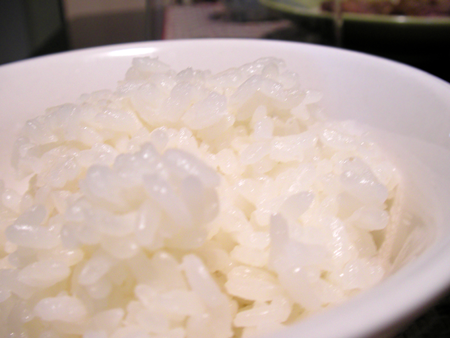 I also love bread, pasta, chips, hotdog etc… but I always come back to simple steamed rice. My family owns few rice fields in Japan, so I grew up with rice everyday. What do I eat with steamed rice? Well, steamed rice is like “main dish” in Japan. 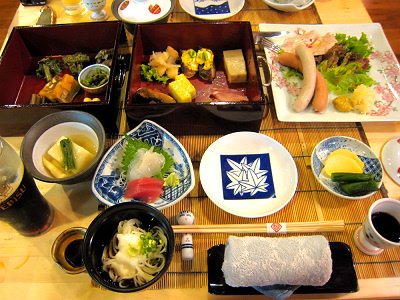 In every meal there is steamed rice, and some side dishes like grilled fish or miso soup. I can even eat one bowl of steamed rice with just few pickles. 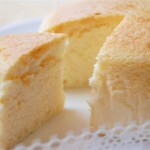 That’s what people used to eat in old era in Japan.